The Wiegands: 2 Easy Juicing Recipes for kids. 2 Easy Juicing Recipes for kids. Our family has just recently started juicing and we seriously cannot get enough! I love that I am providing such important nutrients for my kiddos every single day through fresh produce they might not typically choose on their own. As we’ve started exploring the benefits of juicing, I knew I couldn’t keep it to myself! Did you know that juicing can help you absorb nutrients more efficiently? There is no way we’d be able to eat a few pounds of produce in our diet every single day, but by juicing all those things, we’re getting all of that packed into one cup! Not only that, our kids are trying things they might not try otherwise - things like celery and kale aren’t their first choice, but we can sneak it into their juice and they love it!! As we’ve gotten more into health and wellness over the last few years, we’ve come to learn just how much of our wellness is tied to gut health. It’s so important to make sure we have healthy bacteria to keep everything functioning correctly, and we have to get the bad bacteria out. That’s where prebiotics and probiotics play a key role in our overall health - and veggies are one of the best natural resources for probiotics - that’s the good stuff! Juicing has been shown as some of the best preventative care you can give your body. We love that we can so easily make it a part of our morning routine, and one that can include our kids! I love grabbing my littles and choosing what we’re going to make together for the whole family to enjoy. You need to pick a juicer that works well for your family - THIS is the juicer that we chose and LOVE!!!! Once you have your juicer set up and ready to go, pick out your favorite produce and prep it for juicing. We always wash our fruits and veggies in Thieves Fruit and Veggie Soak from Young Living - it safely and effectively washes produce! You just add a capful to about a gallon of water, soak your fruits and veggies for a minute or two, rinse, and you’re ready! 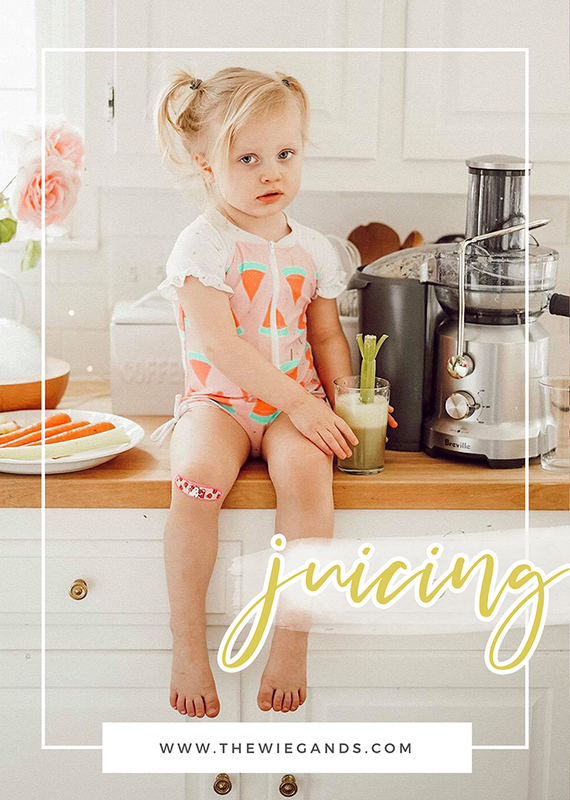 I am going to share with you two of our family’s favorite juicing recipes - these are so so easy, and the perfect way to get started when you’re new to juicing! EASY! Once you’ve washed and dried your produce, add the carrots and apples to your juicer. You can peel the lemon and add it in, or squeeze it into the juice by hand. Give it a quick swirl and divide between four glasses! Carrots are great for eyesight and heart health, and packed with vitamin A. Apples can help reduce cholesterol, regulate blood pressure, and are a great source of Vitamin B! Both are brimming with antioxidants!! Lemon detoxes and balances blood sugar. Wash and dry your produce. Add apples and celery to the juicer. Peel lemon and juice, or squeeze by hand. Give the juice a swirl and divide between four glasses. Celery is a big immunity booster, and works as an anti-inflammatory. Lemon is great at masking that celery flavor for little tastebuds. Keep your recipes simple, let your kids help you choose their ingredients, and you’re sure to have a whole family of little juicers before you know it!